It is a rematch of last year Round 1 clash. Fu leads 3-1 at the beginning with 79, 97, 81 to enter mid-interval. However his performance goes down after the fifth frame, Gould comes back to 3-4 down. Fu hits a 115, the first century in the match. He goes on to win final frame in the session, leads 6-3 at the end. Fu plays quite well and confidently in overall. He plays in a way much different from last year. It is a slow match. 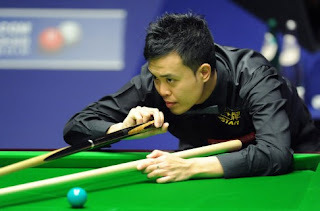 Only eight frames is played in the first session because each frame is lengthy. They go all square 4-4. Mcleod has a break of 85 while Walden has three half centuries, 51, 61, 69. Dott does not have a very good start at the beginning of the match. He leads King 2-0 but King levels to enter the mid-interval. After the mid-interval, Dott finds his way to win. He takes four frames in a row, leads King 6-2 with 69, 58, 73 and a century 102. 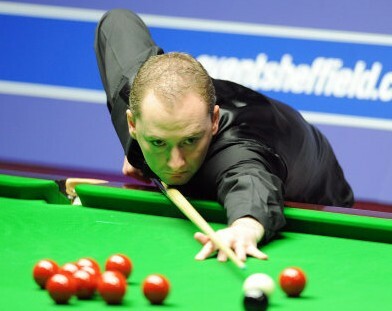 Mark King reduces the gap to 3-6 in the last frame of the session. Bingham leads Ebdon 5-4 before second session plays. Ebdon leads Bingham 8-6 impressively from 4-5 down. Bingham starts to play solid afterwards. Bingham takes four frames in a row, winning the match 10-8 over Ebdon. 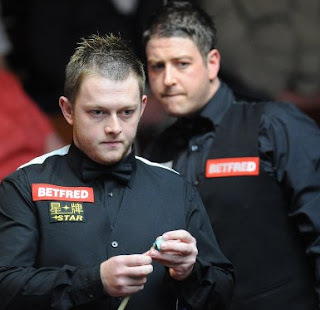 Ballrun Stuart meets Chinese Dragon Ding Junhui to complete for a seat in quarter-final. It is a very close match between the two players. Both of them knock some good breaks, Allen knock 86, 91, 96 while Stevens make 52, 54. Welshman Stevens leads pistol Allen 5-4 at the end of first session.